Roadside Retail: Just Look for the Star? Just Look for the Star? The black colour statement at the new Texaco stations that are being rolled out may be confused for red Esso/Exxon petrol stations. Architectural features of the new Texaco design match sister brand Chevron allowing savings in terms of rationalising components and maybe set the stage for Texaco disappearing altogether in favour of Chevron? Coincidently, Chevron Texaco’s strategy of sharing is also apparent with their competitor Exxon Mobil whose two brands are architecturally identical except that Esso is red and Mobil is blue. Esso/Exxon also share the same ‘On the Run’ C-store which clearly adopts the philosophy ‘Why go to the bother of creating 2 C-store brands when 1 will do it better’ Which incidentally begs the question, ‘Why maintain 2 or 3 petrol station brands when 1 will do it better?’ With cost cutting the name of the game in petrol retail now perhaps we shall see more brands culled within the foreseeable future. 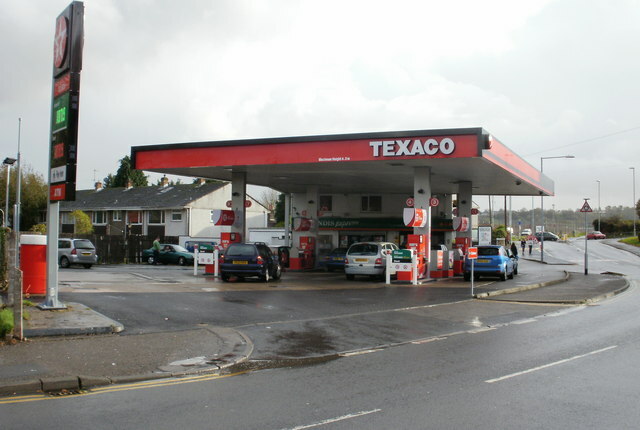 The new Texaco image is clearly more modern and retail but more visually fussy than the previous designs. The canopy fascia is internally illuminated which will increase energy and maintenance costs unless LEDs are used as a light source. Surprisingly the Texaco star does not feature as strongly as previous designs on the spreader given Texaco’s slogans ‘Just look for the star’ and ‘Trust your car to the star’. More so since Caltex the other Chevron Texaco brand located in Asian markets features the angularity of the star to great effect on its stations and within the C-store name ‘Star Mart’.  Ironically while Texaco are moving away from black, other food retailers such as Marks and Spencers are seeing black’s virtues as providing both a contrast with the colour of the merchandise and background for graphics. Black floors however are problematic in that they tend to soak up light that is normally bounced back up. The top photograph probably features a dealer owned site but what happened to 'Start Mart' which led the way in convenince retailing in the early 90's? 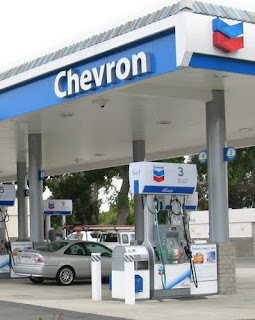 If Texaco and Caltex will ultimately morph to Chevron then perhaps there will be no point looking for the star any more.